What does the scaling-up of negative emissions technologies for environmental law? In my previous posts , I described how most emissions scenarios that are expected to keep warming within 2 or 1.5°C rely on negative emissions technologies (NETs) at large scales and how the new report from the Intergovernmental Panel on Climate Change addresses NETs (as well as how solar geoengineering could offer an additional means to reduce climate change). If the goals for climate and economic growth are to be achieved, negative emissions technologies will likely need to play a large role in mitigating climate change by removing ~10 GtCO2/y [gigatons, or billions of metric tons, of carbon dioxide per year] globally by midcentury and ~20 GtCO2/y globally by the century’s end. 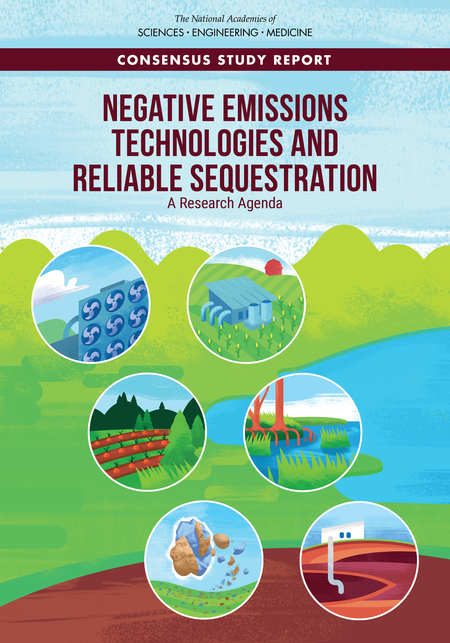 The nation should launch a substantial research initiative to advance negative emissions technologies (NETs) as soon as practicable. What does this mean for environmental law? Most legal issues arising from NETs are not novel. They would pose “typical” environmental risks of land use, impacts on biodiversity and endangered species, pollutant emissions, and post-operational liability that are roughly proportional to their operational scale. At the scales being considered “by midcentury and… by the century’s end,” these environmental risks as well as secondary effects, such as higher food prices due to competition for arable land, would be substantial. What would be novel is NETs’ integration with emissions abatement policies, both domestic and international. At first glance, as negative emissions, NETs could be deducted from an actor’s gross emissions to yield net emissions. But this is easier said than done, and it faces several challenges. One is measuring: how much carbon dioxide did an activity remove? For some NETs — such as direct air capture and bioenergy with carbon capture and storage (BECCS) — this would be reasonably straightforward, as some known volume of gas with a presumably well-characterized composition would be stored. For other NETs, such as ocean fertilization and enhanced weathering, measurement would be imprecise, and accepted best practices would be needed. A second challenge is verification of negative emission methods. Captured carbon might not be permanently sequestered. Underground storage can leak. The management of forests and soils — while not strictly negative emissions technologies — can change at some later date and cause the stored carbon to be emitted. If a state or nonstate actor was credited in one year for removing the carbon from the air, should it be likewise debited for that which was later returned? If so, how? A third challenge is how to govern exchanges of (negative) emissions. Emitting actors might not be the same as removing ones. Domestically, contracts should be able to manage relationships between them, but regulators would, at the very least, need assurances of the removals. The international landscape is more complex. Should such exchanges be internationally between states, or transnationally between private actors? Furthermore, an actor might capture more carbon dioxide than it emits. If there is a carbon price, may it simply be paid for its net removal? In a cap-and-trade system, would this allow others to emit (that is, the cap would be one of net emissions) or not (that is, the cap would be one of gross emissions)? In the US, a tax credit (text, summary) will offer a growing financial incentive for carbon sequestration. Other, mostly European countries are committing to future negative emissions, usually implicitly by speaking of “net zero” emissions at a later date. Internationally, the “rule book” for the Paris Agreement’s implementation will be hammered out at the Conference of Parties in December. In that context, the Transparency Framework for Action and Support will include guidelines for national reporting of emissions and removals of greenhouse gases (although such reporting goes back to the UN Framework Convention on Climate Change and the Kyoto Protocol). In addition, the Subsidiary Body for Scientific and Technological Advice has begun work on guidance to avoid double accounting, including of removals, in international carbon markets under Article 6 of the Paris Agreement. The UN Framework Convention on Climate Change bodies have addressed some of these issues when afforestation and reforestation were incorporated into the Kyoto Protocol’s Clean Development Mechanism. If the years of contention in that case offer a clue, then the road ahead for NETs under the Paris Agreement will be a long one. One technology of geological sequestration injects CO2 into basalt formations where the gas becomes calcite or aragonite (carbonate minerals) in a few hundred days and is thereby sequestered for eons and won’t leak. The reaction is exothermic, so it is favorable energetically. There are several hundred years worth of appropriate basalt formations offshore both coasts. The technology of pumping CO2 into geological formations is quite well established from the offshore oil industry, however, it won’t be cheap.